INTRODUCTION: "The Strange Affair of Spring Heeled Jack" takes place in an alt-history England of the early 1860's with a steampunk flavor and features the colorful Victorian era personality, (Sir) Richard Burton as the main hero. In a distinctive turn from "real history", Burton accepts a commission to become a "special agent" of the king - among other changes Queen Victoria was assassinated in 1840 - while his young friend Algernon Swinburne later emerges as a sort of sidekick; many notables like Darwin, Brunel and a very young Oscar Wilde have cameos. FORMAT/CLASSIFICATION: "The Strange Affair of Spring Heeled Jack" stands at about 380 pages and is divided into 24 named chapters. There is an Appendix that details the "real history" fates of the main personages encountered in the novel. 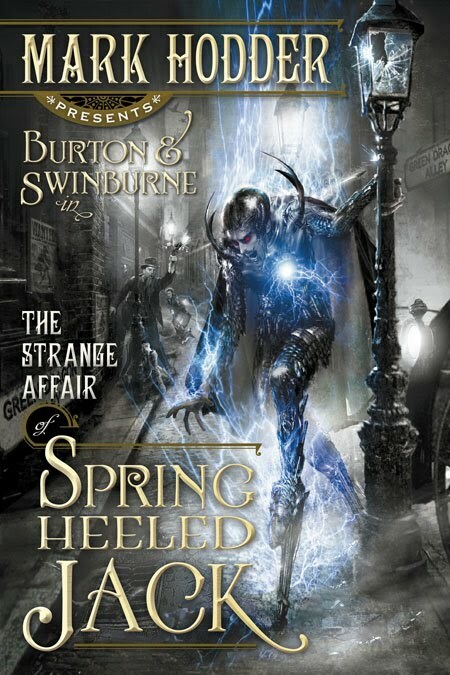 The beginning of a projected series featuring Burton and Swinburne, "The Strange Affair of Spring Heeled Jack" is a standalone which completes its main arc, while leaving hints about further happenings and direction. 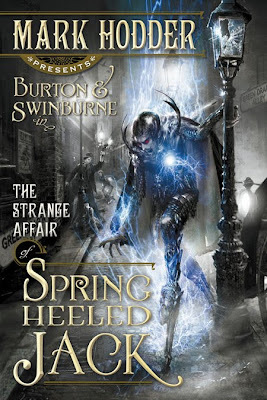 A mixture of steampunk, alt-history, detective investigation, all put in a sf-nal context in the end, "The Strange Affair of Spring Heeled Jack" mixes genres with panache, but its basic flavor is of "steampunk Victoriana". Politically, the main difference is the death of young Victoria decades ago and the contested succession of her husband, while now the main ideological differences are between the Technologists that relish and even want to accelerate the introduction of new inventions and the Libertines that fear those are destroying the "soul" of the country and want to slow or stop them, or at least counter them through art. Of course things are not so simple since there is a group of influential people - Rakes - who evolved away from the Libertine ideology and want to emulate the bio-technological revolution in "morality" and cast all restraints away. They are partly influenced by the legend of Spring Heeled Jack, the strange character that reoccurs at intervals to assault - though generally only to frighten - young girls. Not long returned from an African expedition and ready to debate in a public forum his co-adventurer and former friend, Captain John Speke, Captain Burton is stunned to hear of Speke's suicide attempt. Later when the gravely wounded Speke is kidnapped by mysterious parties, Burton is thrust into the thick of the events and decides to accept a commission from the Prime Minister to investigate a series of strange occurrences that seem related with his colleague's disappearance. "The Strange Affair of Spring Heeled Jack" has been referred to as "steampunk opera" and I felt the description quite appropriate because of its mixture of elements and tonality. There is the occasional descent into farcical grotesque, but a fast pace and an intriguing hero in Sir Richard keeps the book interesting. However for a long while, the interspersing of the steampunk elements with the more traditional Victoriana felt a bit forced as if the author did not quite make his mind which one dominates, while not seamlessly integrating them either. Then about two thirds in, the author takes a gamble - which is foreshadowed early so it did not come as a surprise in itself for me, but its extreme importance in the structure of the book was unexpected - and starts explaining things by turning the novel into a sf one. That worked very well since it balanced the two modes; there was still some slapstick farce here and there that annoyed me a little - villain sword fighting the hero and both declaiming stuff in an operatic fashion - but the last third raises the level one notch. It may simply be that the familiarity with the world building from the first 200 pages or so, makes it feel that way and I leave the reader to decide on his or her own, but I stand by my opinion that the science fictional turn of events made the novel better than if it would have remained a more traditional steampunk one. "The Strange Affair of Spring Heeled Jack" (A) is a debut that gets stronger as the story advances so I see a great potential for the series to become a top one of mine depending where the author takes our heroes and the world they live in. The world-building and the interesting characters are there for sure and the next book is an asap read for me. Definitely have to keep an eye out for this. I became very interested in Burton when Philip Jose Farmer did him in Riverworld. My copy arrived 3 days ago, very much looking forward to reading this. To me the selling point was the cover, I think it's very nice. I got a copy of this book a week or so ago, and just posted a review. With aspects of action, humor, science and politics, this is one of those books that aims for a wide audience, and I think steampunk and genre fiction need that right now. I felt the "twist" was absolutely brilliant, but the beginning dragged for me a little. Once Swinburne started playing a bigger role, and the, um, other character (I don't want to spoil it), the book really picked up for me.